This morning, my 4 year old son Kyle and I drove to the other side of the ranch to check the lambing ewes for my parents, do their morning chores and feed their cows. Upon arriving we quickly noticed a Suffolk ewe in one corner of the pen in labor and a Hampshire ewe in labor in another corner. The Hamp ewe already had one lamb out and its head was up, indicating that she was getting along by herself. However, the Suffolk ewe looked to be in great distress and we could see a head of lamb showing and it was swollen with its tongue hanging out, not a good sign. Taking directions very well, I had my son hold the ewes head while I took a closer examination. Upon feeling around, my hand quickly told me the problem; one head, showing, one head just inside and no legs. It was a case of two lambs trying to exit at the same time through a birth canal designed to pass one at a time. The solution was simple in theory, a challenge in reality. I was able to push the second lamb back into the uterus fairly easily, but with the ewe straining, there was tremendous pressure on the first lamb and manipulating its legs into the birth canal was a chore. To make matters worse, it was a very large lamb and had a distended abdomen, most likely due to extended time in the canal, pressure from its mate and pressure from the mothers straining. After what seemed like an eternity, but more like five minutes, I was finally able to remove the first lamb and the second lamb quickly followed. All the while I was describing what I was doing to my son, who was very inquisitive. The first lamb did not survive, but after cleaning the second lambs mouth out and tickling his nose with a piece of straw and a vigorous sneeze, he began to breathe and bleat to its mother. My son asked about the first lambs condition, and I told him the stress was too much for it and it had died. He said “That’s ok daddy, God had different plans for him.” From the mouth of babes comes such logic and reason. I couldn’t help but get a little choked up when I heard that. Meanwhile, the Hamp ewe had successfully delivered her second lamb without issue. Kyle helped me shake out straw in two pens in the barn, we turned on heat lamps to keep them warm and moved the ewes, with their lambs into the barn. On the way home I knew I had to share this little story. It is too bad more kids and adults, cannot experience some of the challenges that are faced on the farm and ranch. It gives a different perspective to the meaning of life and an understanding of what is involved in the caring for livestock. Wonderful post, Jeff. Absolutely fantastic. Thank you for sharing. Thank you Kelly and you are more than welcome. Farm kids learn early. Great post Jeff. Great post. We’ve had similar situtations with our sheep. At one point we had 3 generations working to save a set of twins and their mother. My Father-in-law was a huge help that day, in part because he gave we a tremendous hint. If you can put a straw bale under the ewe’s flanks then gravity helps a tiny bit with pushing the 2nd lamb back while so you can find the legs of the first. Our daughter (only 6 or 7 at the time) had the job of holding onto the “right” legs, while grandpa held the ewe steady on the bale, and I pushed the 2nd lamb back with all my might. Our adventure had a slightly better outcome-all three survived. 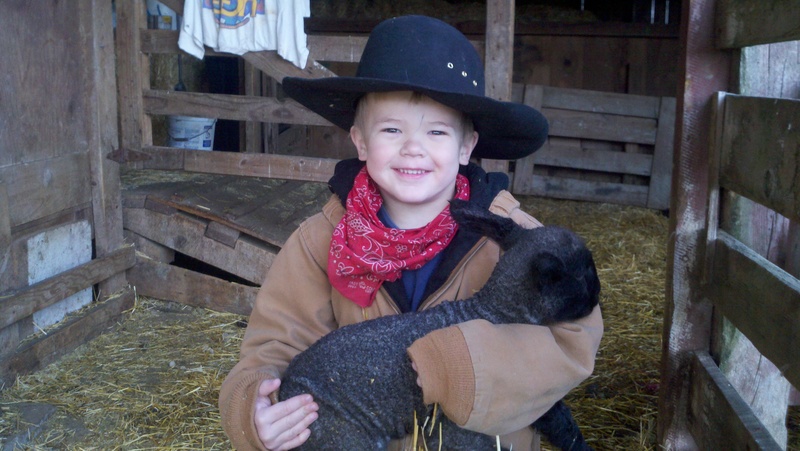 Farm kids do learn great lessons about life and death, and the benefits of hard work. Thank you for sharing your story Jeff. Been there more than I want to admit. Kneeling in a puddle, polled Dorset clipped to a fence, no help…thinking how glamorous farming is. 😀 Might not be glamorous but it is rewarding! 🙂 That it is Jan. Thanks! Thanks for sharing. Great lessons learned on the farm. Your son is one smart little boy. It made me tear up to read those words. Your right and so was he, sometimes death happens on the farm. There is no escaping it. Atleast he is learning a valuable lesson that he can carry throughout his life. Thank you so much for sharing this! God Bless to you both.